Diana Holland is a fun, enthusiastic teacher with more than 30 years teaching experience in Yoga, Pilates and dance. She first studied Ashtanga Vinyasa yoga with John Scott as part of a bodywork and Sports massage course that she was on. Amazed at how balanced she felt mentally, physically and spiritual after each class, she knew her next training would be to become a yoga teacher. Diana went on to qualify as an Iyengar yoga teacher in London after studying extensively with renowned senior Iyengar teacher, Maxine Tobias. Diana now teaches a more rhythmic style of hatha yoga moving with the breath and igniting each yoga posture from the core, creating strong graceful movement. Her classes include simple precise Pilates, meditation, gentle physical release work and guided deep relaxation. 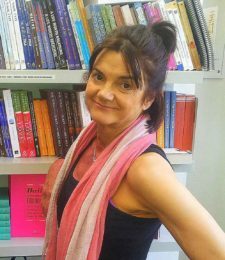 Diana is an experienced physical therapist and hypnotherapist and wishes to introduce all people to the joy and healing benefits of her unique and uplifting style of yoga in happy supportive classes, holidays and workshops. She runs her popular classes at Triyoga Chelsea and The Life Centre, Notting Hill Gate.